I posted this recipe several years back. 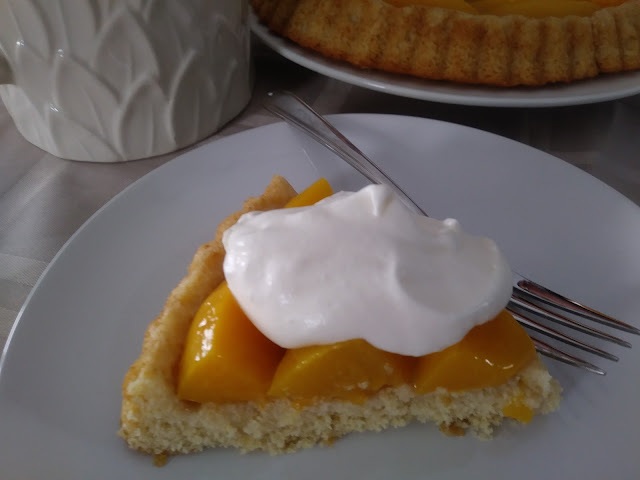 It is still one of my favorite desserts, especially with the simple peach filling. It is my mom's recipe and she baked about 50 of them for her wedding 59 years ago. A very easy recipe that comes together rather quickly. If you don't have a Boden Torte Pan you can purchase them here if you are wanting one. It can also be made in a 9 or 10 inch springform pan and topped the same way without the indentation in the middle. This is a good make ahead recipe to ease your preparations on the day you have company. Bake and fill the cake the day before you want to serve it, it always tastes better the next day. Add egg and beat till mixed in. Add milk and mix until it holds together in a ball. 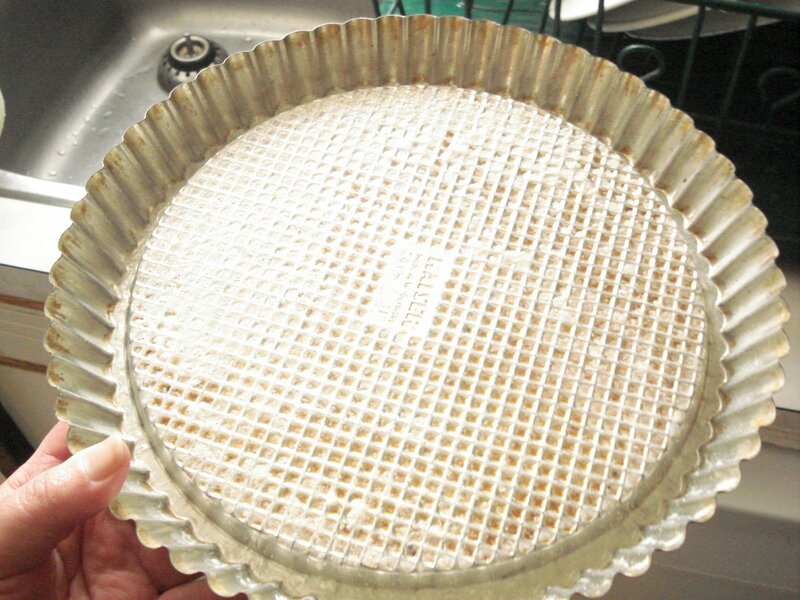 Press dough into a well greased boden torte pan. Wet your hands with a little water to keep the dough from sticking to your hands. Bake at 350 F for 15-20 minutes or until lightly golden. Fill with a variety of fruit and whipped cream, (my personal favorite is simply canned peaches and whipped cream). 1 - 28 oz can of sliced peaches, drained. or choose a variety of fresh fruit arranged in a pretty pattern like strawberries, kiwis and blueberries. Take 1/2 cup of the fruit syrup if using canned. Bring it to a boil over medium heat with 1 tablespoon of cornstarch dissolved in a little cold water, cook it until it is clear and the raw cornstarch flavour disappears approximately 1 - 2 minutes. Cool slightly and spread over fruit. Serve with a dollop of whipped cream and you have a lovely little dessert. Quick and easy. If using fresh fruit I use a commercial glaze by Dr. Oetker and follow package directions. You turn the torte out upside down to fill? Seems like a dumb question! That is not a dumb question at all. When you flip the cake out onto a cooling rack or plate the indent is then on the top and you can fill it with whatever you like. Wow! How in the world did your mother manage to make and store 50 of these before her wedding? I still vaguely recall my mother and godmother baking for my sister's wedding of 500 guests. There were shelves and shelves of baked goods that took 2 months to prepare. I don't know how they kept it all fresh, but somehow they did, and people still talk about it. My mom and I made dozens of these to serve at our wedding over 45 years ago. With a fresh peach topping, it was amazing. Now I can't wait till peach season - these look so good. What a great wedding dessert tradition.